Crowe – November 6, 2018 Peacefully at St John’s House, Newry, surrounded by her loving family. Anna, Doretha beloved wife of Reggie, Granville Gardens, Portadown Devoted mother of Warren and Michael, mother-in-law of Kathleen and Kim and a much loved nanna of Claire, Mia and Oliver. Funeral service in Seagoe Parish Church on Saturday at 12.00 noon followed by interment in the adjoining churchyard. House private. 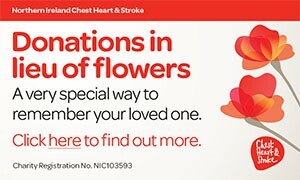 Family flowers only please donations if desired payable to Southern Area Hospice c/o St John’s House, Courtenay Hill, Newry, BT32 2EB. I am sorry to tell you that Anna Doretha CROWE has passed away.